Are All Your Bits The Right Way Round? Forgive the impertinence but do you have all your bits in the right place…? High days and holidays usually sees our family grabbing hold of a jigsaw puzzle or two and our latest wee break was no exception. I bought a new puzzle. (I live on the edge, can you tell?) 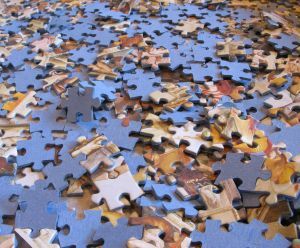 And as we have been completing it bit by bit, and the picture has emerged, I thought to myself what a metaphor for life a jigsaw puzzle can be. The picture is in front of us and all the pieces we need to complete the picture are there, yet sometimes we can be holding exactly the right bit in our hand but be looking at it the wrong way round. It looks like it will fit in one place so we try it out, only to find it really fits well somewhere else but we had to turn it upside down to see. Once we’ve done it it seems so obvious but sometimes we’re looking at our picture for so long we can’t see it. I think that’s a bit like coaching. The women I work with usually have all the bits of the puzzle to hand but sometimes need to turn things another way to see the big picture!